Biggleswade let Saturday’s Midlands 3 East (South) tie slip away with some wrong options, going down by 32-26 against Rushden & Higham. Having played their Joker last week to wrest victory from what looked like a certain defeat they could not do it again this week. Biggleswade were always that little bit off the pace, chasing shadows and never quite achieving the level expected of them. Finding themselves 12 points adrift towards the end of the first half they still managed to get a losing bonus point but it should have been more. In virtually the first three-quarter move of the match Biggleswade lost the services of tall centre Will Simkins who landed awkwardly and had to retire to stop a nose bleed, although he did return later. This meant Zak Pates had to play scrum half so that Ieuan Evans could fill the gap in the centre. The home team took the lead with a converted try and then stretched the lead with a penalty. Biggleswade’s habit of giving away penalties can prove costly when the opposition has a kicker of quality as Rushden had. Playing up the slope Biggleswade raised their game to get back on terms. There was a series of attacking rucks until flanker Liam Dunne went low and through the defence for Biggleswade’s first try. Both sides scored a converted try before the break with number eight Michael Hall taking the direct route to score under the posts. Luke Haverly adding the conversion. Hall was also involved in Biggleswade’s next try picking up from the base of the scrum and finding a restored Will Simkins who stretched his considerable legs and touched down. Despite another successful conversion Biggleswade was still behind as Rushden had added a second penalty. Just one point behind Biggleswade thought that one more try would get them another win when they again came from behind. Rushden though were on fire after a poor start to their season following relegation. They scored two more tries to take the game beyond Biggleswade’s reach although the visitors did score last. With the clock ticking down Biggleswade were driving hard in front of the posts. Suddenly the ball popped out allowing flanker Liam Dunne to see a gap and score under the posts. Luke Haverly drop kicked the conversion to save time but there was none left for Biggleswade to score again. 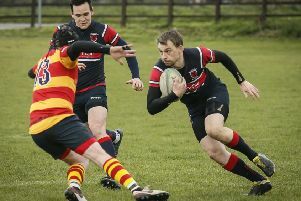 Despite losing but gaining two points for a four try bonus and losing within seven points of the victors they move back to fourth place in the league on points difference. Next up on Saturday at Langford Road is the visit by the highly fancied league leaders St Ives who are unbeaten so far this season. It will be tough one but Biggleswade did beat them on the last encounter away from home in April. But they will have to find their very best form to halt the St Ives juggernaut that have a monster pack to steamroll oppositions.